The Digital Arts and Humanities Initiative at UH explores the full potential of today’s digital resources and capabilities in the broad realm of the Arts and Humanities. The chief goals of the initiative are to create and provide open access for state-of-the-art instances of digital performance, multi-layered digitally-encoded text and translation projects, data mining and visualization, e-publishing, computer-mediated teaching and pedagogy, mapping artistic and humanistic spaces and temporal conceptions, computer mediated exhibitions and events, social media, new media studies, media literacy training, collaborative learning and authoring, software creation, and textual, database, and multimedia archives. Hawaiian History at the University of Hawaiʻi at Mānoa is focused on training graduate students to produce historical analysis that draws upon the vast Hawaiian language “archives” which has long been marginalized by scholars. 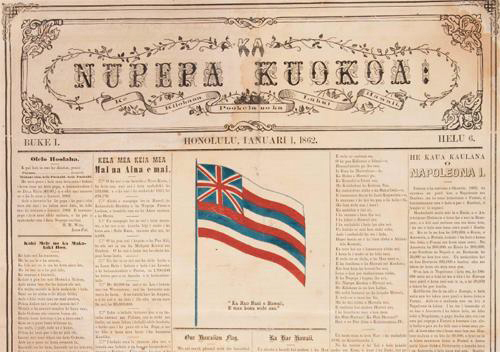 Its goals are to provide open-access to primary source materials in Hawaiian and English for a broad public, but also to provide new historical insights into the field of Hawaiian and U.S. History and Hawaiʻi in the world, based out of these sources. We emphasize excellence in archival research, reading and translation in Hawaiian and English. Themes we are currently focusing on in classes and in digital humanities projects are Hawaiian history and literature through the kanikau project, intellectual history and Hawaiian governance and law. The Department of History hosts two ongoing series, History Forum and History Workshop, for talks and presentations by UH faculty and visiting scholars throughout the year. The series are also available for graduate students to present research and practice job talks. Devoted to historical analysis from a global point of view, the Journal of World History features a range of comparative and cross-cultural scholarship and encourages research on forces that work their influences across cultures and civilizations. Themes examined include large-scale population movements and economic fluctuations; cross-cultural transfers of technology; the spread of infectious diseases; long-distance trade; and the spread of religious faiths, ideas, and ideals. Individual subscription is by membership in the World History Association. The journal is edited by Prof. Fabio López Lázaro. UH Hamilton Library is home to numerous unique collections that shed fresh light on the history, arts, languages and literature, politics and society, law, economy, geography, medicine, botany, environment, and various other fields of humanities, social sciences, natural sciences and technology relating to the peoples and countries across the globe, and especially in Asia, Hawaiʻi, the Pacific, Americas, and Europe. The Library Treasures Initiative, launched in Fall 2017, provides the University of Hawaiʻi with a new platform for showcasing our library’s collections, promoting student research, and inviting donor participation. The Library Treasures Initiative in AY 2018-2019 is running a campus-wide video-shorts competition, in which graduate and undergraduate students in any department, discipline, or field of study at the University of Hawaiʻi—including history majors—are invited to participate. There will be awards for the winner, the second place, and the third place. Register online by February 1, 2019 at https://seschimmel.wixsite.com/mysite. The Library Treasures Initiative is led by faculty and librarians cross-disciplinarily, sponsored by the College of Arts & Humanities and Thomas Hale Hamilton Library, and funded by an anonymous donor.